If you are planning on selling your home and you are in no hurry, then you are fortunate to have come across this article about chasing the market in real estate. Now you might not know what that means, or you might think that it does not apply to you, but you should beware. If you enter the Tallahassee real estate market hoping to get a price higher than your home is worth, then you will end up making the most common mistake of new home sellers and you will end up leaving money on the table. 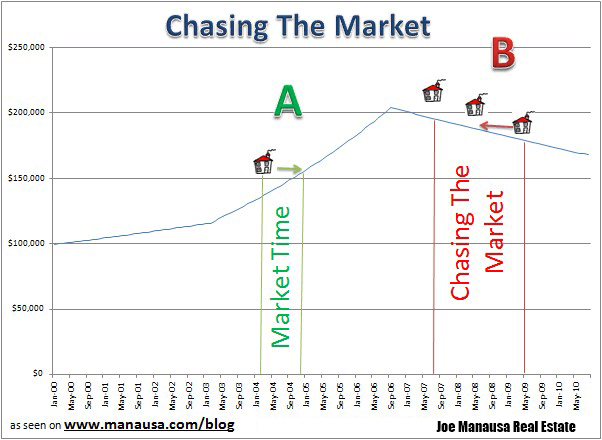 First of all, let's make sure we all understand the phrase "chasing the market." In all markets, prices are typically moving up or down at any given time. Experts in each market can show you current trends and give you an understanding of why the trend may or may not continue, and how the long-term trend is expected to unfold. Trends for housing are created by employment, mortgage interest rates, material costs, supply and demand for homes, etc. By studying these factors, I am able to forecast trends for home sellers in the Tallahassee real estate market. When somebody understands a current trend and tries to do something that is not consistent with current market conditions, you might say that he or she is trying to sell a home today (at tomorrow's value). This is how a home seller ends up chasing the market, pricing high with the expectation that if no miracle occurs today, they will be priced with the market in the future. The graph below shows this vividly. 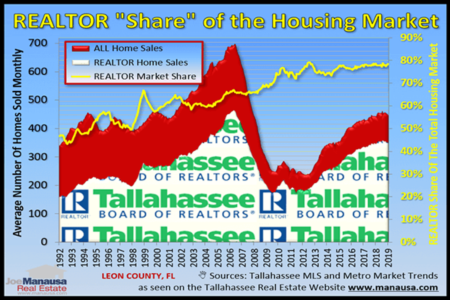 You can see that this graph was created more than five years ago, when the Tallahassee real estate market was in a trend where home values were falling. Home sellers who were chasing the market (see "B" in the graph above) were in a chase that would never end. They asked a price too high for a period of time, but when they finally reduced their price, it was to no avail. Home values had been falling, so their price reduction was an ineffective step as it simply kept their home priced above the market. 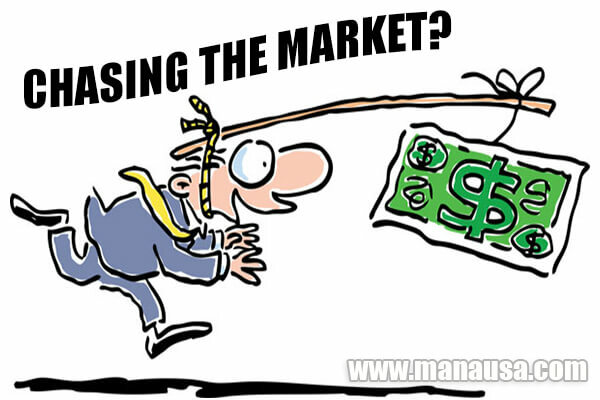 Sellers who chased the market from 2006 through 2012 either never sold, or they lost a large amount of money. But we are no longer in that same type of market, so today's over-priced sellers are chasing the market like many have (see "A" in the graph above) under normal housing market conditions. These sellers figure "I'm in no hurry" so let's try getting (a price that buyers will not pay) and then we'll reduce our price later when we need to move. This is a mistake, though certainly not as costly as it would have been five years ago. Five years ago, I would tell you not to use this strategy as it would guarantee that you lose a significantly large amount of money when you sell your home. After all, home values were falling. Today, even though home values in many areas are rising, it will still likely cost you a few percent (a lot of money for most of us). Because the homes that are sold for top dollar are the ones that sell right away. There is somebody, right now, who wants to live in your area. We refer to this person as your neighborhood stalker, the person who has seen everything on the market but is waiting for something that better fits his needs. 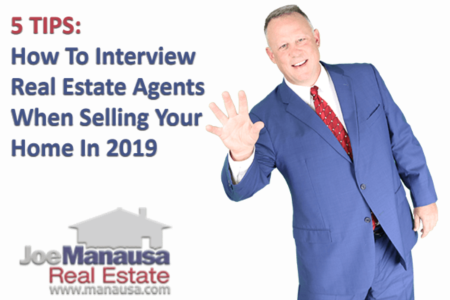 Take a look at the articles referenced below, or check out our Home Seller's Reference to learn why a fast sale puts more money in your pocket than one that allows the buyer to take control of the negotiation. When you finally do decide to sell your home, make sure you have the best plan in place before the market gets to see your home, you'll make more money than you would if you ended up chasing the market! Is There A Stalker Looking At Homes In Your Neighborhood?